It’s a rare feat indeed, but it becomes even more improbable when you consider that when the game began, the lefty-swinging Gennett had hit only three homers on the season, and 38 in his five-year big league career. Furthermore, he had been released by Milwaukee in March and the Reds then claimed the 5’10”, 185 pounder on waivers. Scooter Gennett is yet another example of a primary thesis in Fathers, Sons, & Holy Ghosts: Baseball as a Spiritual Experience which is that our passion for baseball arises, in large part, because it strengthens our faith. Baseball provides events that are so improbable that they suggest the impossible and when the Impossible happens, we label it a Miracle. The concepts of the Infinite and the Eternal are beyond our comprehension, but we can understand the metaphors that suggest what these things are like and this strengthens our faith. Believe me, Scooter Gennett hitting four home runs for the Reds, when Ted Kluszewski, Frank Robinson, Johnny Bench, Tony Perez, George Foster, Adam Dunn, and Joey Votto have not is miracle. Then, of course, there’s the fact that he is officially listed in baseball-reference.com as “Scooter,” which means that he was destined to play baseball because that’s a baseball name if ever there was one. Besides, how many bank presidents do you know are named Scooter? What else could he do? Actually, Ryan Joseph Gennett picked up that nickname when, at the age of five, and refusing to wear his seatbelt, he was taken by his mother to the local police station to have a uniformed officer scare him into wearing it. Frightened that he would be arrested if he provided his real name, the quick-thinking kid gave them the name of his favorite Muppet character. Oh, and to put one final improbable cherry on this most unlikely of sundaes? Though he graduated from Sarasota High School in Florida, where the family moved when he was nine, Scooter was born in Cincinnati, Ohio. Great American Ballpark in Cincinnati witnessed a most unlikely event Tuesday night, courtesy of Scooter Gennett. 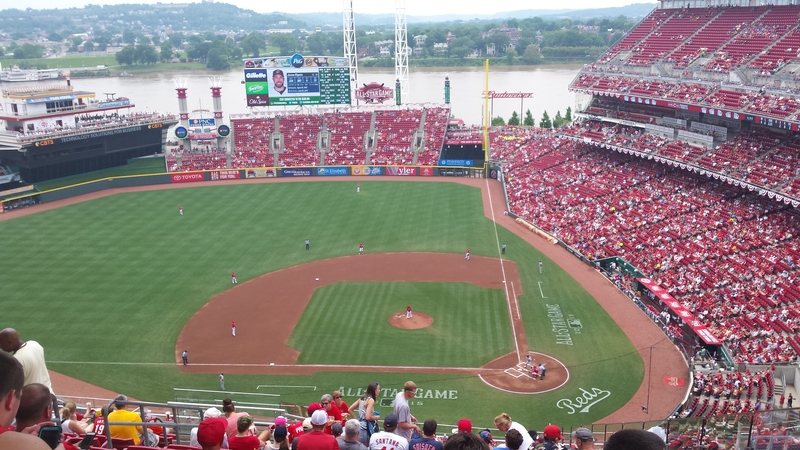 This entry was posted in Baseball Books, Baseball in General, Life is Interesting and tagged Cincinnati Reds, Fathers Sons & Holy Ghosts, four homers in a single game, Muppet Scooter, Scooter Gennett. Bookmark the permalink. Like I’ve always said, it’s all statistical. It’s the Random that creates the magic.